US consumers may be cursing rising gasoline prices which are rapidly approaching an average of $3.00 across the nation as Brent hits a new 4 year high above $84, but that is nothing compared to the horror that motorists across most emerging markets are facing. With currencies across the developing world tumbling as a result of a toxic mix of global trade tensions, the strong dollar and rising U.S. interest rates, dollar-denominated crude has become all the more expensive. 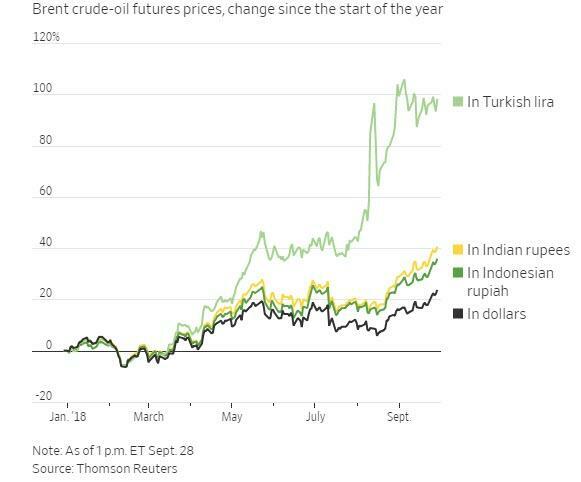 And while the price of Brent crude, the international oil price gauge, has risen by 22% this year in dollar terms, its cost has doubled if you’re buying in Turkish lira. It is up 39% in Indian rupees and 34% in Indonesian rupiah. And don't even mention Argentina. The soaring prices are forcing emerging-market countries and central banks to act. According to the WSJ, India, the world’s third-biggest oil importer, is weighing temporarily limiting oil imports, while Brazil and Malaysia have introduced fuel subsidies. On Thursday, central banks in Indonesia and the Philippines both raised interest rates to tame rising inflation. “Emerging markets already have a lot of problems as it is, and when you throw an oil price spike to the mix, that creates another big risk factor,” said Jon Harrison, managing director for emerging markets strategy at TS Lombard. The sharp spike in oil - and gasoline prices - assures a double whammy to the economy as local infrastructure is forced to, literally, slow down. And absent a major change, such as a sharp drop in the dollar or oil prices, the large developing nations like Turkey, India, the Philippines and South Africa are out of luck as they import all or most of their oil. This creates a feedback loop where rising prices are spurring higher inflation and expanding already large current-account deficits, further exacerbating the economic hit. An increasing import bill further widens the deficit, which puts further pressure on their currencies. The only option these countries have to normalize the surging import prices is to push up their currencies by raising rates. And that's what they are doing: last Thursday, Bank Indonesia, the country’s central bank, raised rates for the fifth time since May. In a statement, the bank pointed to a “surge” in crude imports bringing the country’s trade deficit to over $1 billion in August. Also on Thursday, the Philippine central bank raised its key interest rate, citing rising inflation. Speaking to Reuters, the country’s finance minister said that the recent rise in oil prices is his main concern now. Unable to wait for monetary policy to funnel through to the broader economy, some companies are taking matters into their own hands. According to the WSJ, in August India’s Jet Airways reported a rise in fuel costs of more than 50% year-over-year in the three months to June. CEO Vinay Dube had already talked of “a tough phase” for the industry, singling out the depreciating rupee and high fuel prices. Meanwhile, Indonesian state-owned oil company Pertamina is facing a squeeze as the bill for importing foreign crude soars. For politicians and governments across developed nations, where spending on gasoline is one of the biggest discretionary outlays, rising prices represent a major "career threat" as high oil prices tend to bring street protests and industrial action, leaving them with difficult choices and nowhere more so than in Asian economic powerhouses India and Indonesia, where pro-business governments face re-election next year. In India, which imports around 80% of its oil, refiners met in Mumbai earlier this month to discuss reducing the country’s reliance on imported crude, a spokesperson for Indian Oil Corporation, the country’s largest state-owned refiner, said. That could, for instance, include running down inventories rather than buying new oil, he said. But the problem may be especially acute in Turkey, where energy makes up roughly two-thirds of the nation’s current account deficit. Addressing the threat of soaring prices, last week, Turkish Finance Minister Berat Albayrak said the only long-term solution was greater energy independence, and he pledged to boost renewable sources of energy. Of course, this is hardly the first time that a surging dollar and high oil prices have coincided with falling currencies and widening trade deficits for emerging markets. In 2013, when Bernanke unleashed the "Taper Tantrum", concerns that the U.S. would unwind monetary stimulus sooner than expected prompted selling in emerging market currencies during a period when Brent was trading at over $100 a barrel. Given such experiences, some of the more prudent companies have used derivatives to hedge their exposure to just this kind of outcome. The more prudent are even benefiting from rising prices: “The fact is that we have dealt with higher oil price before,” says Satrio Tjai, managing director at Rajawali Corp, Indonesia’s mining to palm oil group. Tjai says his company is even benefiting from the rising oil price, given a new government mandate that requires diesel fuels to be blended with the biodiesel that Rajawali supplies palm oil to. Unfortunately, for every Rajawali that hedged, there are 99 other companies that did not, and the economic slowdown, coupled with political chaos that may soon result unless oil prices drop, may be the next trigger of emerging market turmoil in the coming months.